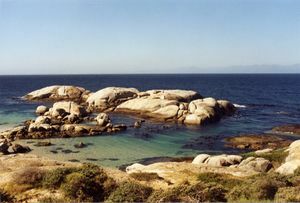 The dive site Windmill Beach is an inshore rocky reef in the Froggy Pond area of Simon's Town on the False Bay shore of the Cape Peninsula, near Cape Town in the Western Cape province of South Africa. 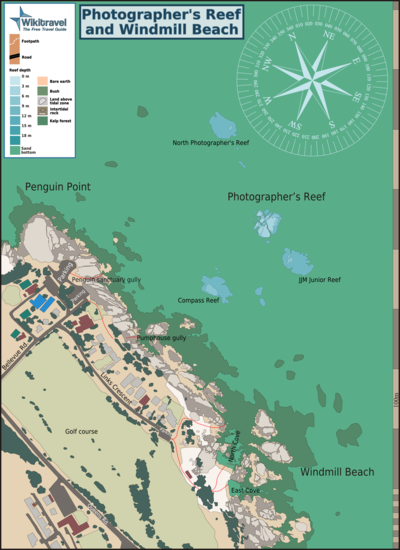 Map of the dive sites at Windmill Beach, Photographer's Reef and Penguin Point. This site has very easy and protected beach entry and a small cove with sandy bottom that is suitable for training exercises, while also having a varied topography, diverse ecology and large area. About halfway between the point at Boulders and Oatlands Point. 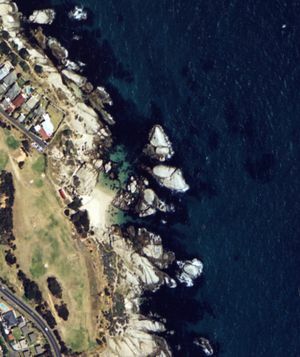 This site is in a Marine Protected Area (2004). A permit is required. The site is entirely inside the Boulders Restricted Zone. The origin of the name "Windmill Beach" is not known. 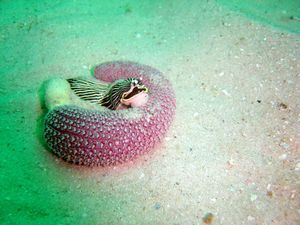 Maximum depth is about 8m on the sand bottom near the inshore reefs. 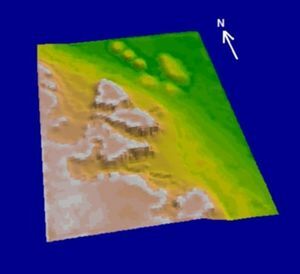 The 10m contour is about 300m offshore. A view of the north and east coves from the rocks to the south of Windmill beach. The tide is low. At high tide the water extends over most of the visible beach, about as far as the dark patch of kelp washed up in the middle of the beach. Sand bottom with large granite outcrops and boulders, some with very high relief, extending from flat sand to near or above the surface. Slowly shelving beaches. The north cove is very gradually sloping sand near the beach, but gets rocky near the mouth, where the depth gets down to about 3 to 4m. In this area there are lots of small boulders which provide shelter for a variety of invertebrates and fish. At the mouth it gets deeper quite suddenly over a rocky ledge, and drops down to sand bottom which continues all the way north to Photographer’s Reef and beyond. There are a number of pinnacles in the area to the north east and east of the north cove. The south cove inirially slopes more steeply and remains mostly sand bottom. It flattens out soon and is bordered by rock on both sides. There are offshore reefs to the east of Windmill Beach. One is at 300m off the south cove on bearing 115° magnetic. Most of this area is sand bottom with a large population of purple sea pens to the north of this reef at a depth of about 10 to 12m. This is a suitable place to find the as yet undescribed nudibranch known as Pierre’s armina,(or Striped sand slug) as it feeds on these sea pens. 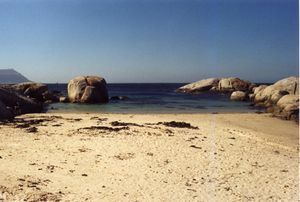 Gilchrist’s armina has also been seen on the sand in this area. Geology: Granite of the late Pre-Cambrian Peninsula pluton surrounded by flat white sand. 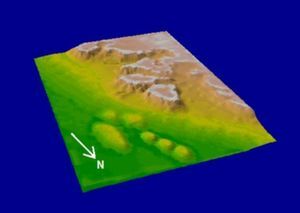 3D visualization of Windmill Beach dive site. Limited parking at the end of Links Rd. This area has a history of vandalised vehicles and theft, and there is a slight risk of being hit by a golf ball. There are municipal public toilets and changing rooms on the path to the beach, which are usually shabby and not very clean. There is a fresh water shower which sometimes works. The East Cove at Windmill beach. The entry and exit at the north cove at low tide. Generally considered a shore dive. Drive South through Simon’s Town on the M4, turn left into Bellevue Rd, Right into Links Rd, and park at the end. Warning: This is reputed to be a place where cars are frequently broken into and contents stolen. Lock your valuables where they can not be seen. Walk through the gate and down the path past the ablution block, (there is a fresh water shower but it is not always in working order) and under the trees to the beach. The south entry/exit is directly ahead. 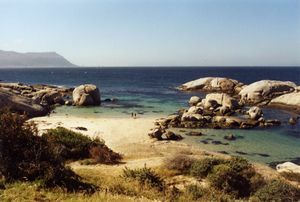 Also known as the east cove, it is a gently shelving beach facing east into False Bay with large granite rocks on both sides. It is a very popular entry and exit area as it is often diveable when the rest of the bay is unpleasant. This is a popular training site as it is reasonably deep within the shelter of the cove and the sandy bottom is good for skills exercises. The rocks to both sides are pleasantly overgrown with typical local species and are a relatively safe introduction to the area. 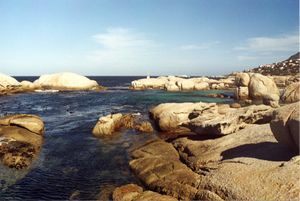 The north entry/exit is to the left and faces north into False Bay. It shelves even more gently and also has large granite rocks to both sides. It is very sheltered from easterly winds, and westerlies do not produce much wave action due to the short fetch. Unfortunately this cove is very shallow. This is an alternative shore entry and exit for Photographer's Reef, which is straight out about 400m. There is also an entry from a little beach to the north west of north cove. Turn left at the gate and walk along the path beside the wall to the large flattish granite outcrop, then turn right and follow the path at the side of the rock down to the beach. There is a low flat topped rock sloping gradually down to the water with a pair of low masonry pillars at the end. This is a good entry and exit for the north side. The entry and exit points at Windmill Beach are safe in all conditions that a reasonable person would consider diving. A wide variety of invertebrate and fish species may be found at this site. 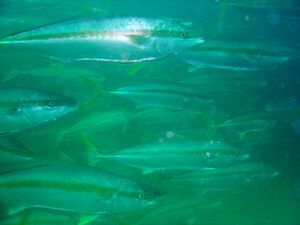 Do not discount the shallow waters of the north cove, as a variety of small fish live in this area. Enter at the east cove, keep the rocks to your left and work your way round the reefs all the way to the north cove. For a shorter dive you can go through a gap between the boulders to the north cove. The reciprocal route to the previous, starting at the north cove and exiting at the east. Try to take in the pinnacles. The more adventurous may try a search for the elusive Striped sand slug. This requires a swim of about 300m on bearing 115°magnetic to a depth of about 12m, then a slow sweep north east while searching among the purple sea pens. Save at least 80bar for the return. Another view of the east cove showing the training area in the narrows to the right of the photo. No special skills required. The site is popular as a training area for entry level divers. The east cove has easy entry and exit, a sandy bottom at suitable depth, reefs to both sides, some kelp and access to more interesting reefs just beyond the cove. 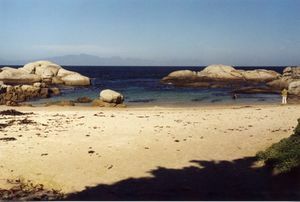 The site is also suitable for snorkelling and for night dives. A light is useful for looking into crevices and a compass is useful, particularly on night dives, for keeping track of where you are. This page was last edited on 16 January 2013, at 00:33.